The Statement is addressed to the UN Secretary-General, UN Security Council, UN Office of High Commissioner for Human Rights, UN Office of High Commissioner for Refugees, UN Human Rights Council, to the heads of UNICEF, UNESCO, European Union, Council of Europe, OSCE, to International and European Ombudsman Institutes, Asian Ombudsman Association, OIC and the Ombudsman Association of its member states, European Network of Ombudsmen for Children, International Peace Bureau, ombudsmen of different countries, embassies of the Republic of Azerbaijan abroad and foreign embassies in our republic, the Azerbaijani Diaspora organizations. From time to time genocide acts were committed against the Azerbaijanis, including the Genocide in 1918, and unfortunately they have never been given historical assessment at the international level. From the beginning of the 19th century, thousands of Armenian families were moved from Iran and Turkey to the ancient Azerbaijani lands Karabakh, Nakhchivan, Zangazur, Iravan provinces and other regions. The aim of the purposeful genocide, ethnic cleansing and deportation policies against the Azerbaijanis, executed for more than two centuries by the Armenian nationalists and their supporters, was to expel our compatriots from their historical lands and to establish “Great Armenia” state in these territories. The most horrible integral part of this policy was the genocide of the Azerbaijanis in 1918 which is distinct for its grave consequences. If we consider historical facts, Armenians realized their outrageous claims under the Bolshevik flag masterly using the February and October 1917 revolutions. Since March of 1918 civilian Azerbaijani population was mercilessly exposed to massacre just for their national and religious affiliation by the armed Dashnak-Bolshevik troops, Armenian nationalists; people were burned alive, rare historical and cultural monuments, hospitals, schools, mosques and cemeteries were destroyed. The massacres committed in Baku city, as well as other cities and districts of Baku province on March 31 and April 1-2, 1918, reached mass scale, the Armenian forces murdered ruthlessly more than 30,000 civilians. At that time numerous ancient buildings including Ismailiyya, a masterpiece of the world architecture, also the sanctuaries were scattered shelling, minarets of Juma and Tazapir mosques were seriously damaged. Later on, genocide and plunder acts were committed with special cruelty against our nationals in Shamakhi, Guba, Kurdamir and Salyan districts, Karabakh, Zangazur, Nakhchivan, Iravan, Shirvan, Lankaran and other regions. During these events more than 70 villages of Shamakhi were totally destroyed, 7,000 people were killed. As it is shown in the historical sources; it was a proof of pre-planning of the massacre that 2000 Armenian soldiers and ammunition loaded to 60 trucks were sent to Shamakhi even from the middle of March. 122 villages in Guba, nearly 40 villages in Lankaran regions were destroyed and burned down, many homes were looted and hundreds of innocent people, including women and children, were massacred. Although many years passed, that bloodshed has not been forgotten, it left indelible impressions on the memory of our nation. After the restoration of independence of the Republic of Azerbaijan, we gained the opportunity to learn our history better, the truth hidden for a long period of time was gradually revealed, thus the distorted realities appear to be more evident now. Political assessment to the bloody events of March 31 was regarded only 80 years later, with signing of the Decree on the Genocide of Azerbaijanis by the President Heydar Aliyev dated March 26, 1998, thus, March 31 was declared as the Day of Genocide of Azerbaijanis which is marked every year in the country at state level. Last year, the relevant plan of actions was implemented extensively in accordance with the Order signed by Ilham Aliyev, the President of the Republic of Azerbaijan, “On the 100th anniversary of the 1918 Genocide of Azerbaijanis”, aimed at delivering the truth about those crimes against humanity more thoroughly to the country and world community. Numerous new facts and documents were collected as a result of recently conducted studies, it was proved that the geographical coverage of the bloody acts committed by the Armenian nationalists during March-April 1918 and later periods had been wider, and the number of tragedy victims was several times more. Last years, the facts that revealed mass human killings committed by Armenians during 1918 events were discovered in Guba. 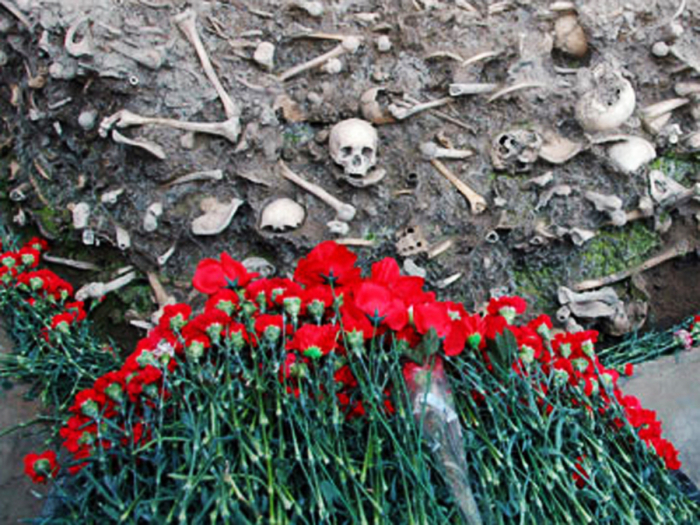 Innumerable human bones and other material evidences found there obviously prove vandalism of the Armenian murderers during those massacres. The Guba Genocide Memorial Complex was opened as a proof of mass murder of people in these territories and a sign of respect for their memory. This historical site is visited by the country population, as well as foreign guests. Recently, the Patriarch Kirill of Moscow and all Russia also paid a visit to this Memorial Complex when he was in Azerbaijan. It is shown in the Resolution No. 96(I) of the United Nations General Assembly dated December 11, 1946 that genocide, being a denial of the right of existence of entire human groups, is one of the most serious crimes against humanity. The elements of crime of genocide are set out in the UN Convention on the Prevention and Punishment of the Crime of Genocide adopted by the Resolution 260 (III) of the UN General Assembly on December 9, 1948. According to the Convention genocide means acts committed with intent to destroy a national, ethnical, racial or religious group in whole or in part. Each of these acts shown in this document was committed during March-April 1918 against Azerbaijanis by the Armenians, and thus these events should be qualified as genocide. The history demonstrated that the Armenian nationalists did not give up their odious intentions, mercilessly exposed our civilian compatriots to further massacres and resorted to falsify events for concealing their intent. As a result of the next ethnic cleansing, aggression policies proceeded by Armenia since 1988, Nagorno-Karabakh, an integral part of Azerbaijan, going beyond its boundaries also the Lachin, Kalbajar, Aghdam, Jabrayil, Fuzuli, Gubadli and Zangilan rayons were occupied, consequently 20 percent of our lands were exposed to invasion, 20,000 Azerbaijanis were killed, more than one million people became refugees and IDPs, their rights were massively and grossly violated. During this invasion mass killings were executed by the Armenian nationalists and terrorists in Khojaly city, Karkijahan, Malibeyli, Gushchular, Garadaghly, Aghdaban villages and other settlements of Azerbaijan. The international law, as well as UN Security Council Resolutions 822, 853, 874, 884 from 1993, UN General Assembly Resolution on “The situation in the occupied territories of Azerbaijan” dated March14, 2008, Resolution 1416 from 2005 and Recommendation 1690 of the Parliamentary Assembly of the Council of Europe, as well as European Parliament's Resolution on Nagorno-Karabakh from October 23, 2013 once again asserted that occupied Nagorno-Karabakh and adjacent seven rayons are the integral part of the Republic of Azerbaijan. However, the Armenian side demonstrates unconstructive position as usual, regularly violates the ceasefire regime and creates obstacles for the peace in the region. The genocide policy of Armenia against our civilian population is still continuing, which results in the murder of civilians, including children. Impunity of perpetrators committed such kind of deeds contradicts the main universally targeted priorities, UN Principles, Sustainable Development Goals. The President of the Republic of Azerbaijan Ilham Aliyev always makes efforts for putting an end to the aggression continued for 30 years, resolution the conflict in a peaceful way; he has repeatedly raised the issue before influential international organizations on necessity of resolving the conflict within the territorial integrity of our country in accordance with the norms and principles of international law, withdrawal of occupying forces from the Azerbaijani lands, returning of IDPs to their homes, and it has been reflected in the relevant decisions of these organizations. Despite passing four Resolutions of the UN Security Council and decisions of the OIC, OSCE, Non-Aligned Movement and relevant decisions of other international organizations, Nagorno-Karabakh conflict has not yet been resolved in framework of the norms and principles of international law, territorial integrity and sovereignty of our country within the internationally recognized borders. Thus, commemorating the blessed memory our martyrs, the murdered people during the genocide committed in 1918, maintaining the above-mentioned, the norms and principles of international law, I call all states and authorized international organizations to recognize the massacre of the Azerbaijanis as an act of genocide for the sake of justice, to support our justified position, to unite in solidarity and increase efforts in this direction. I resolutely declare that these violent crimes committed against humanity shall be legally and politically assessed as an act of genocide at the international level, Armenia shall be sanctioned, the requirements of international documents to be followed. The territorial integrity of Azerbaijan and violated rights of refugee and IDP compatriots should be restored, captives and hostages must be liberated and returned to their homeland, also the perpetrators committed murder of civilian people shall be soon brought before the justice tribunal and punished.